Genes encoded in DNA sequence give a complete set of instructions for the development of a new organism. However, an organism, like the human body, develops also over a life time adapting to environment and experience, for example to diet and exercise. Recently, researchers found that such factors act through so-called epigenetic mechanisms that alter an organism's development without altering DNA sequence. One such mechanism involves DNA methylation, a chemical modification of one of the four bases of DNA, cytosine, that replaces a hydrogen atom with a methyl group. There are several ways that DNA methylation exerts its biological function, bringing about a long-time adaptation of an organism to its environment, in some cases even across generations. Our previous experimental and computational studies indicated that methylation changes mechanical properties of DNA which can affect gene expression. DNA methylation can also inhibit gene expression by impeding proteins that control the translation of DNA sequence into protein synthesis. One mechanism involves DNA methylation sites recruiting genetic control proteins that inhibit DNA expression through their local presence. 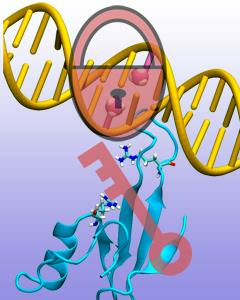 In a recent study, computational biologists performed MD simulations with NAMD along with quantum chemistry calculations to determine recognition of methylated DNA by proteins. The simulations revealed how a certain genetic control protein, called methyl-CpG binding domain protein, acts in tandem with methylated DNA like a key and a lock, methylated DNA and protein perfectly matching each other. More details can be found on our methylated DNA website.